Excellent review. The Scorpio performance has always been one of its USP ever since its launch. Having said that in its current avataar and current price it is simply not worth it. The insides are comically small compared to dimensions outside, the ergonomics are still a disaster (can you adjust the seat while the door is closed? ), the dashboard is still too small, the quality inside is not great either and while additional equipment like touchscreen is great, the ergonomic placement makes its almost useless and those rain gutter channels were out of fashion on the first day of launch of the Scorpio and 16 years after they are still there. Worse still its not even safe in a crash. I am sure Mahindra makes a killing on every model they sell and do not care either because it still gives them the volumes they desire. Last edited by extreme_torque : 16th February 2018 at 10:35. It is much more than merely being a butch body on frame SUV. It is much more than a beauty of an engine that sits inside the hood. It is much more than the utilitarian nature that it offers. What makes a Scorpio (and Safari) so special is the aspiration value attached to it. For all those of us growing up in the nineties and early 2000s, Scorpio was THE macho vehicle we wanted to one day lay our hands on. Forget the technology, we were naive then or call it lack of options, anyone remotely interested in a vehicle of this size held the vehicle in the highest of esteem. I still remember the old TV adverts from a decade ago with tag line "Nothing Else Will Do" and thinking to my self - 'Some Day I am going to lay my hands on this vehicle and take it to Leh'. Well times changed and with it we saw an influx of new age UVs but the aspiration was undeterred ..errm up until about a couple of months ago when they announced the pricing of the latest Scorpio. Well,19 Big ones for a 4x4 Scorpio! What a travesty. The Only Scorpio I would have bought is the S4+ 4x4 in its previous Avatar because to me it was the most VFM and a practical 4X4 money could buy in India (no disrespect to the Thar, it is extremely capable as a 4x4 but practical, eh eh!) for close to 14L OTR. The fact that it is an aspiration vehicle for a lot of folks and in a country that runs wild on emotions, Scorpio will sell and will sell well albeit the shortcomings of the product. But all said and done the new pricing is a deal breaker (and heart breaker) for me. It is with great remorse I have taken the decision, dear Scorpio. I will unfortunately have to look elsewhere because you are no longer VFM or practical anymore. Mahindra thanks for ruining it ! Apologies for the longish rant, I am after all one of the emotional fans still in love with the vehicle (but not the price). I happened to rent a Scorpio from Zoomcar the other day and my first impression was that it's got more power than what it can handle! I really don't understand why it needs a power boost. Honestly, the only updates worth investing in this car was with respect to ride and handling! The way this car rolls and dives during quick lane changes and hard braking is simply scary! Besides, there's nothing that justifies the price tag! Thanks for this brilliant review ! Must have been boring for you guys since nothing much new was to report except of course that extra 20 bhp power. Baring few tweaks, Mahindra has never bothered to refresh its existing models rather they believe in keeping different options in same segment. I have driven my workplace's 2014 mHawk S4 Scorpio extensively. Always loved the high seating commanding front view. The responsive mHawk is real real gem of an engine, almost zero turbo lag and man that low end torque is so addictive. The positives end here though. The poor handling was always a downer, even on straight highways I never felt confident. The way it nosedives and disturbs on hard breaking is nothing to write about. I once took it to long ghat section and that was the scariest winding road experience. Scorpio just hates corners (far by even SUV standards). My average speed of the trip came out 15 km/h , such was the level of carefulness. From outside it looks robust and strongly built (doesn't all SUVs look macho?) but once you start noticing the flimsy doors, dashboard etc, the cabin just doesn't feel safe. An after thought? Doesn't look neat to me. 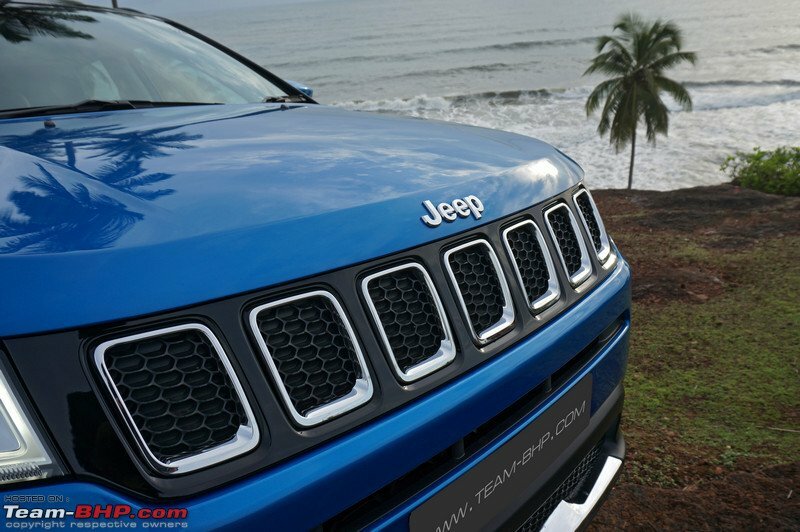 Can't understand the logic behind copying Jeep's grille design. Looks out of place. Same goes with TUV grille. What about AT option? Any faintest idea when it will come? Why are they not plonking a good AT with 4x4 . And that will again push the price 20+. Giving 20+ to a vehicle with no 2nd and 3rd row space. Mahindra needs some serious space management lessons. country keeps buying cars like the Bolero and Scorpio despite the availability of alternatives. The problem is from day one, with 7 people on board there is no space for luggage. Providing AT might end up cannibalizing XUV sales which is already selling in low numbers compared to Scorpio. Unless you really want those unsafe jump seats, Bolero pretty much fall in sub 4M SUV space. You can look for Ecosport/Brezza/Nexon. Yes, you will miss the boxy looks and option of having 4WD(available only in non AC variant I believe), but the safety and comfort that new gen CSUV offer can't be matched by a Bolero. Dear @GTO it would be help of we also had, as a standard review feature, pics of someone from the review team sitting on the front/rear seat? That would surely help folks figure out the head/leg room. Please do consider. With the 6-speed 'box, highway mileage should improve. Any feedback? It has, by roughly 1-2 kms for a liter of diesel. The S11 has done 2,000+ kms and even in the infotainment it shows FE in the region of 16-17 kmpl. Cruises quite comfortably in 6th now and has enough torque to propel it on load in 6th from ~60kmph. NVH appears better as well than my S10 4WD. Anyone can suggest options for a comfortable 5 seater with a body on frame or monocoque construction with practical GC similar/higher than Scorpio and should have a 4L? In this price bracket or lower? Not bringing in the Storme. Last edited by Sheel : 17th February 2018 at 14:55. You can't get comfort and 4L together in this segment. The closest match is the Duster AWD. It does not have 4L, but the first gear is really short. Renault or any other manufacturer has huge potential if they launch a capable product which doesn't look as aged and has not many issues. I am perfectly fine with those interiors given the price range of ~17L OTR. Some how, the Scorpio looks better than Duster and doesn't appear to have aged as much. DMAX VCross, Duster AWD, Used Fortuner/Pajero sport, Used XUV AWD- all I could think about. XUV and Duster miss 4L option though but will be far more comfy than Scorpio. Certainly Mahindra has gotten smart in the market by continuously doing incremental improvement/changes to keep their ageing products relevant. Scorpio and XUV numbers despite all these years is a proof. But they desparately need some new hits. Everything else has been mixed bag from Mahindra. Also dont get the logic of de-tuning the torque ? Its not much to differentiate from XUV from a marketing standpoint since HP is same. A large part of M&M's market is based out of the tier-1&2 cities. In the semi-urban areas the Scorpio still has a cult image and like the Bolero, continues to grow on its legacy and appeal. Its still relatively easy to maintain and repair and though its ancient on tech, it continues to be a rugged work-horse to move people around. I doubt if many in these areas would go for the top spec trim with the 4X4 and 140hp tune. Which puts a question on who will buy the top spec? For an urban commuter, the slight premium for the entry level XUV will feel better VFM both from a product and an image standpoint. Having driven a Scorpio and from my viewpoint as an XUV owner, I can vouch for that the fact that the Scorpio's handling and braking is atrocious. The ergos are not the best and neither are the quality levels which surprises me considering the same manufacturer did a much better job with the XUV. Oh and now since the Scorpio has breached the Rs 15 lakh mark, it has a certain compass and Hexa to contend with as well.